Fuji Hana | Oh No! Not Another NYC Food Blog! Glatt kosher Japanese restaurant serving things like rack of lamb teriyaki, ribeye steak and burgers alongside Japanese and Chinese dishes on Avenue U in Gravesend (blocks from the F). 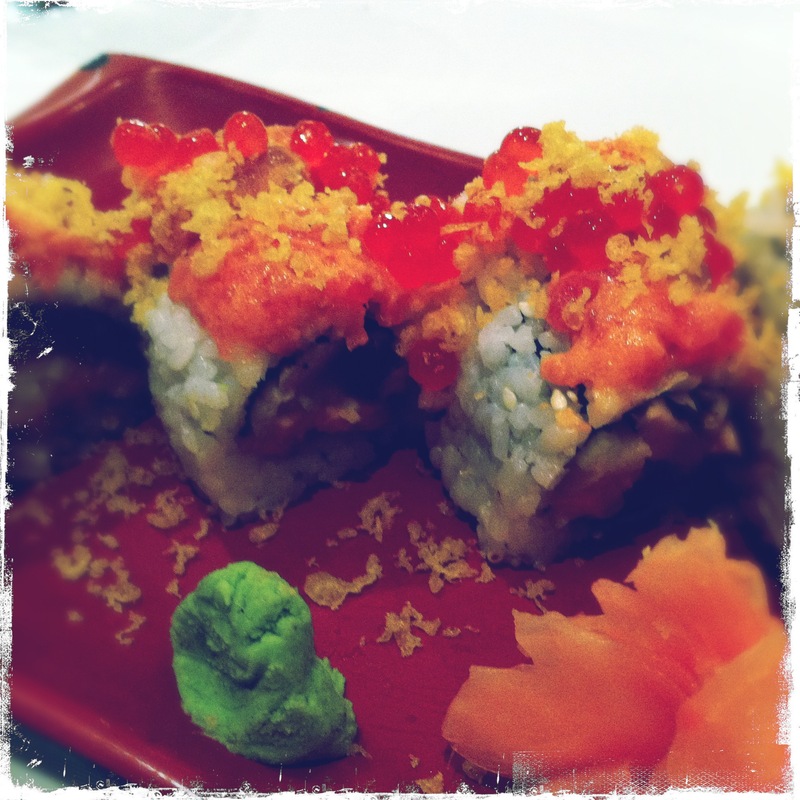 My DH and I split the Fancy Roll (pepper kinda cooked tuna and cucumber with spicy tuna, large globes of salmon roe and ikura crunchies on top). This wrap was so-so. Not horrible, not great, and not terribly memorable. Not particularly expertly rolled, either. My DH had a whopping huge cauldron of Chicken Ramen (chicken, vegetables and yellow ramen in chicken broth). This dish was bland, and boiled chicken is better served to sick pooches, but according to my DH it was not the worst thing he’d ever eaten. This dish could have been great, too. Some depth to the broth from kombu or bonito would have put it over the edge. Also, some spice and egg yolk (and non-boiled chicken!). 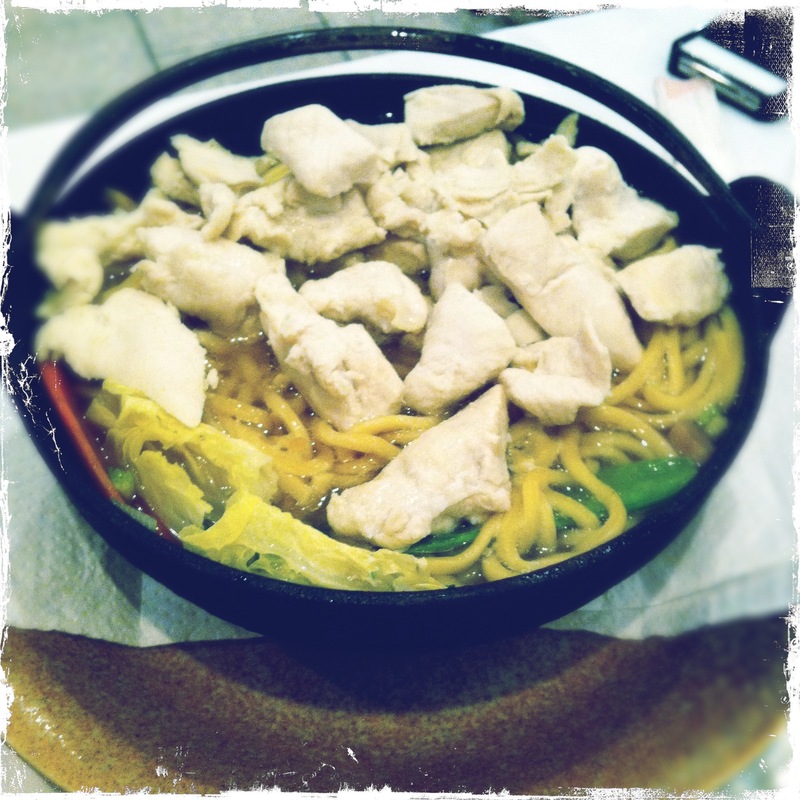 I had a huge plate of Chicken Yakiudon (sautéed flat noodles with chicken and vegetables). Yay. My favorite. Boiled chicken. What? does being Kosher preclude one from using seasoning? 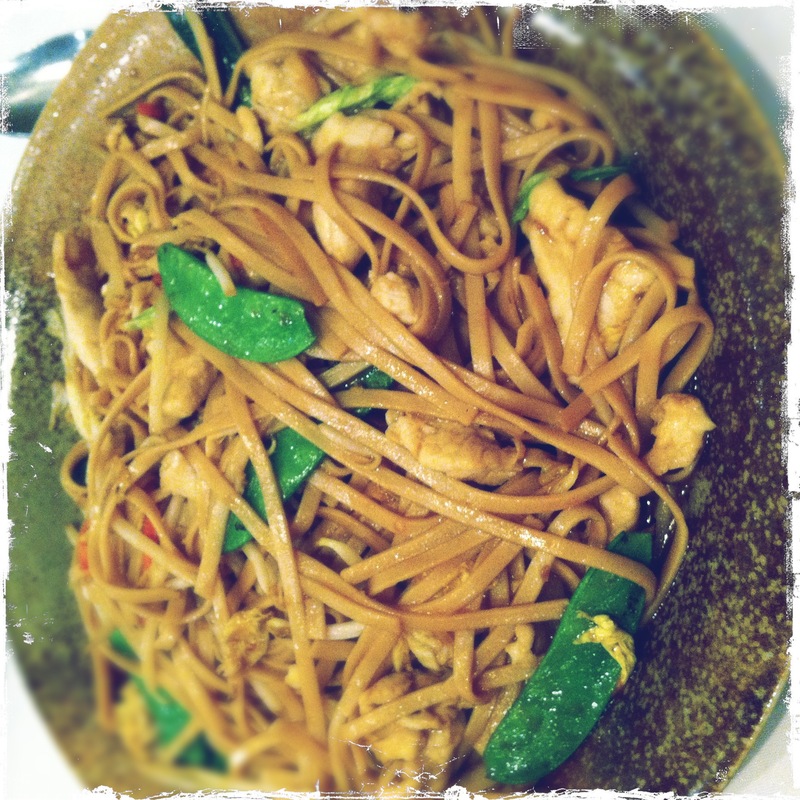 This dish was also very bland, but the noodles at least weren’t covered in goopy sauce. They also had that pleasant taste only achievable with a burning hot wok. With a little work and some depth, this dish could also have been great. A little miso, a little acid, spice, and all would have been delicious. I could have maybe (maybe) even forgiven the rubbery, joyless chicken. Both meals came with a house iceberg lettuce salad with carrot slivers, a slice of cucumber and a few nice grape tomatoes. The dressings were interesting – a light ginger dressing with almost a mango chutney taste in the background and a green herby dressing that tasted almost exactly like the mint chutney served at Indian restaurants in salad dressing form. Kind of like a place time forgot back in the 70s or 80s. 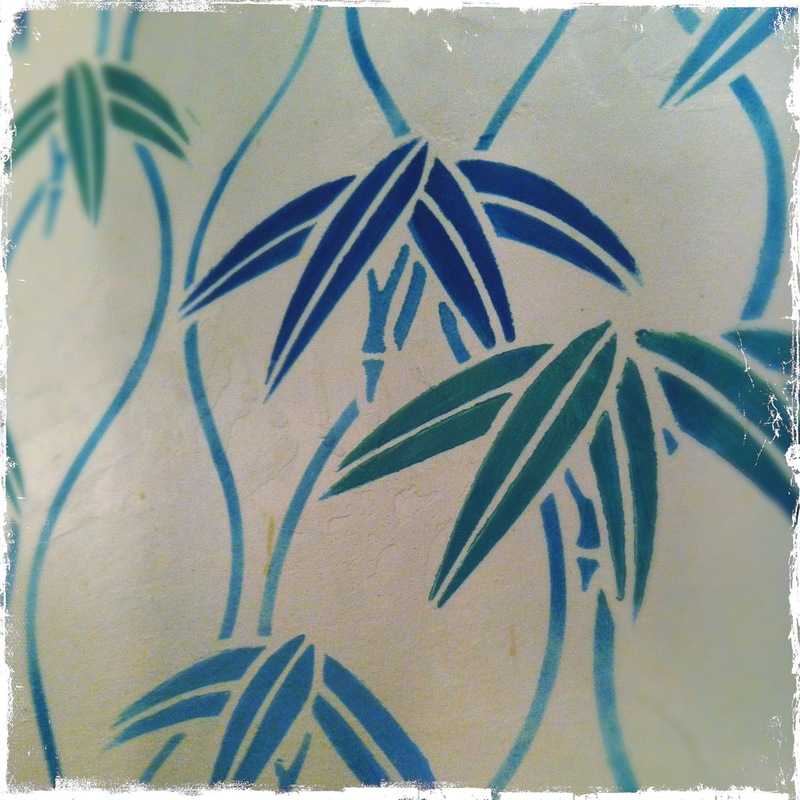 Lots of formica, long white tablecloths, pink, and some very interesting wall coverings. Terrible. our server sucked and was much more interested in checking his phone than waiting on us. I think he gave up after we received our meals; other servers checked on us, got the to-go boxes and brought the check. Meanwhile, our server was sucked into the depths of the Internet. I think this place stays in business since it is Kosher and the only place to have a sit-down dinner for blocks in the middle of a residential area. Prices were about $20 per entree and $15 per “fancy” roll; portions were easily large enough to serve 2, especially of the ramen. That was seriously served in some sort of small-ish cooking vessel. This was a blind pick out of convenience, and in hindsight not the best choice for the first sit-down meal in our new neighborhood. 2 1/2 out of 5 – we won’t be in a hurry to go back. We prefer taste in our food.